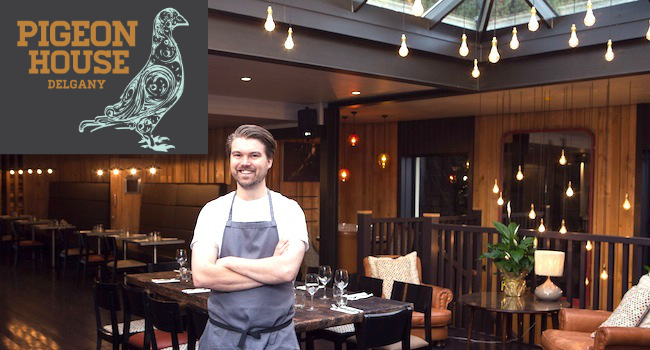 There is a new restaurant in Delgany, called The Pigeon House, opened up by restaurateurs Brian Walsh and Paul Foley, it has proven to be a huge hit for people in South Dublin and Wicklow, recently awarded Best Newcomer at this years Restaurant Association of Ireland Awards. Unveiling a fresh look, The Pigeon House at the Delgany has undergone a refurbishment with dark wood, warm leather and glowing light bulbs suspended from the ceiling making for a mellow atmosphere to compliment the easy dining experience. We have a 2 course dinner for 2 people plus a bottle of wine for only €45. Please note there is an extensive private car park to the rear of the restaurant. We have also included some photos of the restaurant, food and menu to tempt you! This is a taste we highly recommend! – Offer based on the full A La Carte menu, supplements apply on premium steak cuts + scallops.